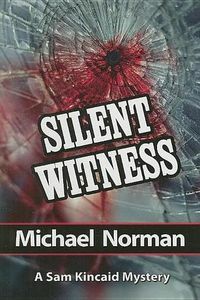 Silent Witness by Michael Norman, a Mysterious Review. Review: Sam Kincaid, head of the Special Investigation Branch within the Utah Department of Corrections, and Detective Lieutenant Kate McConnell return to look into the mysterious death and disappearance of two witnesses to a robbery in Silent Witness, the second mystery in this series by Michael Norman. A cult of Mormon polygamists, headed by 45-year-old Walter Bradshaw, has been exiled from the Fundamental Church of Jesus Christ of the Latter Day Saints. Under Bradshaw's leadership, they decide to build their own church in southern Utah, funding the cost by robbing banks. During the hold up of an armored van, officers in the van show their guns, and the shooting begins, leaving two men dead, one being a relative of Bradshaw. The Bradshaws, however, get away with some money. After a high-speed chase, the fugitives are captured. Bradshaw, under warrant for previous offenses is immediately incarcerated. When the investigation begins into this crime, it is discovered there were two witnesses. Arnold Ginsberg, an accountant, was just leaving his office when the attempted robbery occurred. He is willing and able to give testimony at trial and identify the would-be robbers. Also, able but not too willing to give testimony, is Robin Joiner, a 24-year-old graduate student at a local university. Two days before the inquest, Ginsberg is battered and stabbed to death in his garage. An attempted abduction is made on Robin but she is able to escape and goes into hiding. To Kincaid and McConnell, this sounds like a "slam-dunk" case. They had the lawbreaker in custody, so all they had to do was find the girl and have her testify. They find, however, there is more to this crime than just theft, murder and a missing girl. Arnold's secret life leads Kincaid and McConnell into the gay underground of Salt Lake City and a partner who seems to live a lifestyle far exceeding the couple's means. And when Robin is finally located, she not only refuses to testify, giving no reason for her decision, but also refuses protection. It takes everything in their powers to unravel what ultimately becomes a most complicated case. Silent Witness is a terrific police procedural that also includes personal dilemmas for Kincaid. His ex-wife wants their 8 year old daughter, now in Sam's primary custody, taken away from him because of the danger of his job, and to move to Atlanta where she will have primary custody and be safe. Sam must find a way to prevent this. He also has a new boss who is not too thrilled with the ways Sam handles his job. He and Kate are in love, but she's not too sure she wants to take on a new husband and his family. Sam understands this and but how long is he willing to wait? Simply put, Silent Witness is a solid entry in this series. Special thanks to guest reviewer Betty of The Betz Review for contributing her review of Silent Witness. Acknowledgment: Poisoned Pen Press provided an ARC of Silent Witness for this review.